The EFFECT function is categorized under Financial functionsFunctionsList of the most important Excel functions for financial analysts. This cheat sheet covers 100s of functions that are critical to know as an Excel analyst. it will calculate the annual interest rate and the number of compounding periods per year. The effective annual interest rateFinanceCFI's Finance Articles are designed as self-study guides to learn important finance concepts online at your own pace. Browse hundreds of finance articles and guides to learn about the cost of capital, financial analysis, ratios, multiples, rates of return, profitability metics, and how to evaluate the overall is often used to compare financial loans with different compounding terms. As a financial analystFinancial Analyst Job DescriptionSee a real Financial Analyst Job Description including all the skills, experience, and education required to be the successful candidate for the job. Perform financial forecasting, reporting, and operational metrics tracking, analyze financial data, create financial models, we often need to make decisions on which financial loan will be best for the company. The EFFECT function will be helpful in such scenario and will facilitate comparisons, ultimately helping in making a decision. Nominal_rate (required argument) – It is the settlement date of the security. The security’s settlement date is a date after the issue date when the security is traded to the buyer. Npery (required argument) – It is the maturity date of security or the date when the security expires. 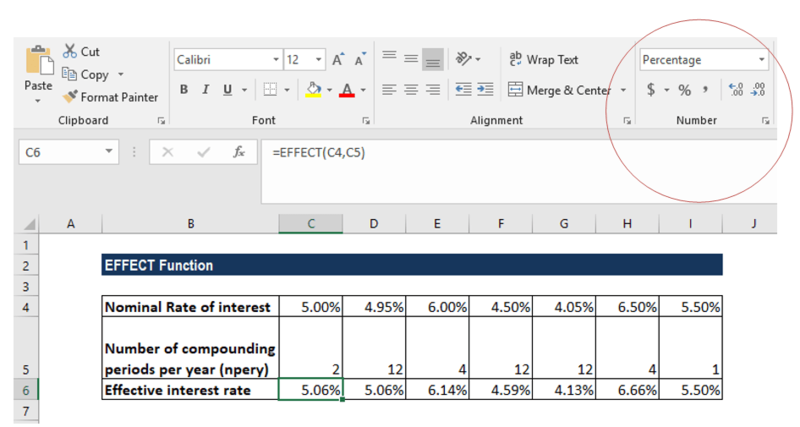 How to use the EFFECT Function in Excel? Chances are that the result of the EFFECT function is displayed as a decimal or shows 0%. The issue is likely to be due to the formatting of the cell containing the function. 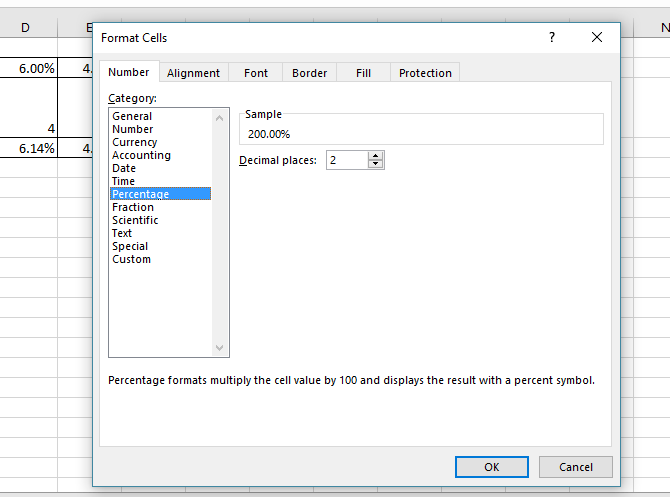 It can be fixed by formatting the cell as a percentage with decimal places. Use keyboard shortcut CTRL+1 (i.e. Select the CTRL key and while holding this down, select the “1” (one) key). A format box would open up as shown below. Now, we can select Percentage from the category list on the left side of the dialog box. It will open to more options on the righthand side of the control box, which allows us to select the number of decimal places that we want to be displayed. After selecting the desired number of decimal places, click OK. 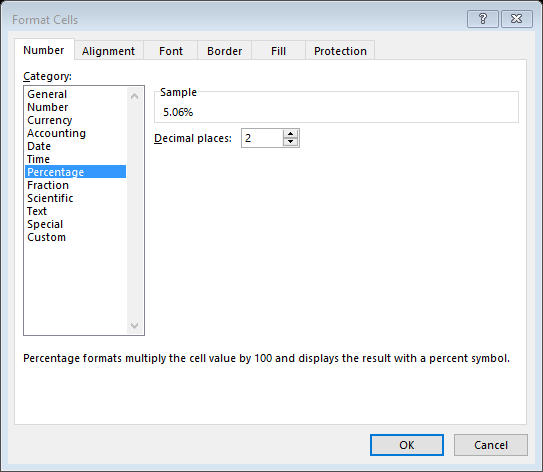 The other method is to click the Home tab and select the range of cells on which the formatting will be done. Click on the Number tab and from the drop-down menu, select Percentage. Here, the nominal_rate is the nominal interest rate and npery is the number of compounding periods per year. The nominal rate argument is not a numeric value. The npery argument is not a proper numeric value. The given nominal rate argument is less than or equal to 0. The given npery is less than or equal to 0. If npery is in decimal format, it is truncated to integers. The EFFECT function is related to the NOMINAL function through Effective rate = (1+(nominal_rate/npery))*npery – 1.